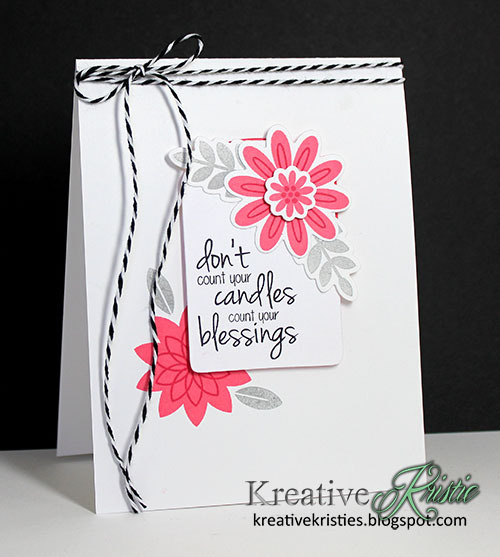 Kreative Kristie: Eva's Favorite Flowers & Coordinating Dies---YES, please!!! Eva's Favorite Flowers & Coordinating Dies---YES, please!!! Hi everyone! I am super excited to be able to share one of the new products that will be offered in Catherine Pooler Designs online store! YES, Catherine is opening her own shop this weekend. She is going to sell the past stamp and die collections that are part of the previous released Stamp of Approval collections! Super exciting, right? The first Stamp of Approval box, the Friendship collection had an amazing stamp set called In Bloom: Eva's Favorite Flowers. So many awesome flowers to stamp and layer. It is one gorgeous set and now that it has coordinating dies, it just makes this set so much more versatile!! I love stamp sets with matching dies, so many more opportunities to get creative and no FUSSY cutting! I prefer to not fussy cut, if I can help it. I absolutely love this color combo and went a bit crazy making 3 different cards using these same colors. :) I am sharing two today and will share the last one soon. For more information and all the details, head over to Catherine's blog! She has a video and some more cards to share. Hi Maggie! Thank you always for your encouraging comments. Yes, the rainbow card was made using the dies. :) Fun, right?! Truly, it is! Can't wait. Love the soft red & grey combination. Very pretty! That black & white border on your rainbow design is lovely. Love each and every one Kristie!! Kristie, your cards are awesome, and what you did with that leaf on the rainbow card...I'm kinda in awe here! Fabulous Kristie. I'm pleased that there are matching dies. Fussy cutting never gets them as nice. 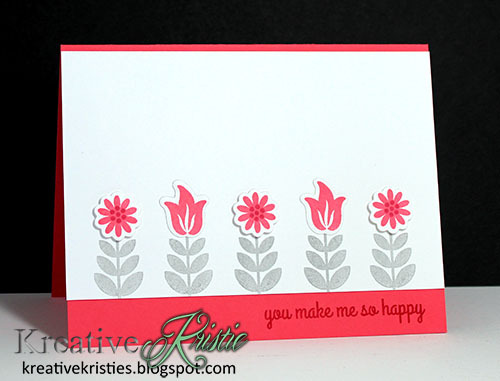 I am so in love with the way you used these Eva's Favorite Flowers stamps and dies Kristie! That top card is a stunner! And what a unique way to use the dies in the second card. I would have never thought of that. You have no idea how much I want you to live next door!! How exciting is this news? YAY! Beautiful cards. Love them all especially the first one. Gorgeous. Once again, the white space totally showcases the gorgeous colors and the sweet, SWEET clean & simple designs! LOVE the colors and design on your middle card. Wonderful cards, but of course the rainbow one is the best! Rainbows always steal the show! I absolutely love the combination of the slate with the berry on your stamped floral cards. Really makes the cards stand out!